Airship Ventures: Steampunk Airship Pirates? As we tell people, never a dull day in the airship business. We received some email from a band of... Airship pirates? The band Abney Park rehearses deep in the Belly of the HMS Ophelia, in our Post Apocalypse Studio. Its a Steampunk thing, you wouldn't understand...or would you? Check out the video, or purchase the album on iTunes. Been wondering when Airship Ventures and the original airship pirates would meet. 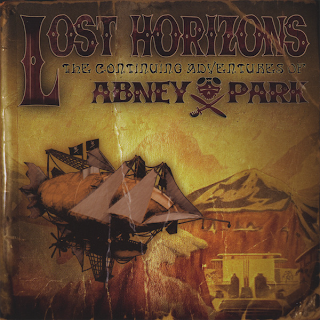 Abney Park is definitely a fun band. They'll be playing in the San Jose Civic Auditorium on Nov 1, so you should check them out if you get the chance. See http://www.steampunkconvention.com/ for details. Will those of us in the area for the convention be able to tour your facilities and ooh & ahh at your airship by then?